distribution Widely scattered over the western two-thirds of the state, east barely into the western Coastal Plain. Interestingly, nearly all of the mountain and western Piedmont records have come in the past few years, suggesting a possible westward range expansion in the state, though most range maps show the species occurring over the majority of the eastern United States. Likely absent at middle and higher elevations in the mountains. A puzzling scarcity of records from the middle of this range in the state -- such as the central and western Piedmont. abundance Uncommon in the eastern Piedmont. Rare to very locally uncommon elsewhere in the mountains and Piedmont. Very rare in the western part of the Coastal Plain. flight Mostly early May to mid-July, with an early date of 20 April. A seemingly quite late record on 8 August is open to question, though there are now a number of records for mid-July. habitat Breeds at rivers and large streams, where rocky or with riffles. behavior Males perch along the shore on the ground, or on rocks in the rivers. They may fly well out over the rivers. comments This is a very striking species, quite black on the abdomen with very contrasting yellow markings. And, the male's club is very wide -- cobra-like, giving rise to the common name. 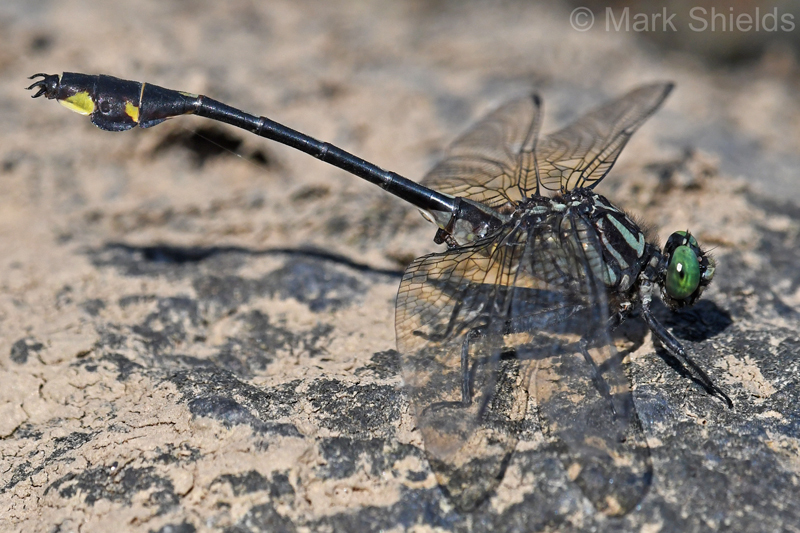 Even so, there are a few other clubtails (such as Skillet, Splendid, and Blackwater) with wide clubs, and thus sight records must be made with care. Indeed, a few photos on this website have been re-evaluated by experts (in late 2016), and several photos reported as other species have been determined to be Cobra Clubtails by website editors/reviewers. Comment: Madison, 2016-07-12, Resting on a shrub along the French Broad River near Hot Springs.